The MacCarthy Reagh (Irish: Mac Cárthaigh Riabhach) dynasty are a branch of the great MacCarthy dynasty, Kings of Desmond, deriving from the ancient Eóganachta, of the central Eóganacht Chaisil sept. The MacCarthys Reagh seated themselves as Princes of Carbery in what is now southwestern County Cork in the 13th century. Their primary allies in the initially small territory itself were O'Donovans, and members of the Ui Chairpre; both were recent arrivals, gaining their lands from the O'Mahonys of Eóganacht Raithlind and the O'Driscolls of Corcu Loígde. The historical record for this period is very confused and a precise sequence of events cannot be reconstructed. A portion of Carbery was conquered around 1232 by Donal Gott MacCarthy, King of Desmond, from whom the dynasty descend. His son Donal Maol MacCarthy, 1st Prince of Carbery, was the first ruler of the new principality. Their descendants would expand their territories considerably and forge a small, wealthy kingdom distinct and independent from the larger Kingdom of Desmond, as well as largely independent from the Earldom of Desmond and from England, which would last into the early-mid 17th century. Fínghin Mac Carthaigh, the victor for Gaelic Desmond in the Battle of Callann and other campaigns, is considered to belong to the MacCarthys Reagh, being a son of Donal Gott. The line of the MacCarthy Reagh were in frequent conflict with the line of the MacCarthy Mor, and the MacCarthys of Duhallow and Coshmaine, all of which were generally in conflict with the Fitzgeralds and FitzMaurices which comprised the lines of the Earl of Desmond and the Earl of Kildare, respectively. The dynasty became very successful during the 14th to 16th centuries, accumulating great wealth and possessing what was at times the most formidable, although not the largest army in the Desmond region. MacCarthy Reagh princes such as Florence MacCarthy were highly active in the politics and wars of Munster. A later branch from Bansha, County Tipperary, descendants of Donal of the Pipes, would relocate to Toulouse in France and be created the Counts MacCarthy Reagh of Toulouse (Comtes de Mac-Carthy Reagh). The renowned Jesuit preacher Nicholas Tuite MacCarthy was from this line. From another branch of the dynasty descended several more lines of counts and viscounts in France. Florence MacCarthy was the compiler of Mac Carthaigh's Book, and the Book of Lismore was commissioned by an earlier member of the dynasty. The controversial Blessed Thaddeus McCarthy is believed to have belonged to the MacCarthys Reagh. The line of the MacCarthy Reagh was not represented among the Gaelic nobility of Ireland granted courtesy recognition. In the wake of the MacCarthy Mór scandal there remains much controversy surrounding the reestablishment of titles used more than 400 years ago. However, it is possible that a legitimate successor as Chief of the Name of MacCarthy Reagh of Carbery may arise, and one that would be distinguished from their kin, the also prominent MacCarthys Mór and MacCarthys of Muskerry. As patrilineal descendants of the 4th Prince, but not the 5th Prince, the MacCarthys of Dunmanway, belonging to the MacCarthy Glas and MacCarthy Duna septs, are not technically MacCarthys Reagh. However, most historians and genealogists refer to all descendants of Donal Gott as MacCarthys Reagh, and it is the case that, should the "senior line", descendants of the 5th Prince, fail, then the MacCarthys of Dunmanway would become the "new" Princes of Carbery. 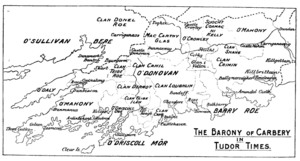 Muskerry West and Muskerry East, baronies in central Cork that were part of the Tudor period principality of Carbery. 1 2 Butler, "The Barony of Carbery"
Butler, W. F. T., "The Barony of Carbery", in Journal of the Cork Historical and Archaeological Society Volume X, Second Series. 1904. pp. 1–10, 73–84. Butler, W. F. T., Gleaning from Irish History. Longman, Green & Co. 1925. Carroll, Michael J. and Alan Langford (illus. ), The Castles and Fortified Houses of West Cork. Bantry Design Studios. 2001. D'Alton, John, Illustrations, Historical and Genealogical, of King James's Irish Army List, 1689. 2 vols. London: J.R. Smith. 2nd edition, 1861. Duffy, Seán (ed. ), Medieval Ireland: An Encyclopedia. Routledge. 2005. Ellis, Peter Berresford, Erin's Blood Royal: The Gaelic Noble Dynasties of Ireland. Palgrave. Revised edition, 2002. "Emma Cavendish" (short story, original author unknown), in The Last of the O'Mahonys, and other Historical Tales of the English Settlers in Munster. London: Richard Bentley. 1843. FitzPatrick, Elizabeth, Royal Inauguration in Gaelic Ireland c. 1100–1600: A Cultural Landscape Study. Boydell Press. 2004. Lyons, J., and H. W. Gillman, "Togher Castle and District, County Cork", in Journal of the Cork Historical and Archaeological Society, Volume I, Second Series. 1895. pp. 481–97. MacCarthy Glas, Daniel, The Life and Letters of Florence MacCarthy. 1867. MacCarthy, Samuel Trant, The MacCarthys of Munster. 1922. O'Donovan, John (ed. and tr. ), Annála Ríoghachta Éireann. Annals of the Kingdom of Ireland by the Four Masters. 7 vols. Royal Irish Academy. Dublin. 1848–51. 2nd edition, 1856. O'Hart, John, Irish Pedigrees. Dublin. 5th edition, 1892. Ó hInnse, Séamus (ed. and tr.) and Florence MacCarthy, Mac Carthaigh's Book, or Miscellaneous Irish Annals (A.D. 1114–1437). Dublin Institute for Advanced Studies. 1947. Ó Murchadha, Diarmuid, "The Battle of Callan, A.D. 1261", in Journal of the Cork Historical and Archaeological Society, Vol. LXVI, No. 204. July–December 1961. pp. 105–116. Ó Murchadha, Diarmuid, Family Names of County Cork. Cork: The Collins Press. 2nd edition, 1996.